Peter Preston was born in 1938 and died on 6th January 2018. 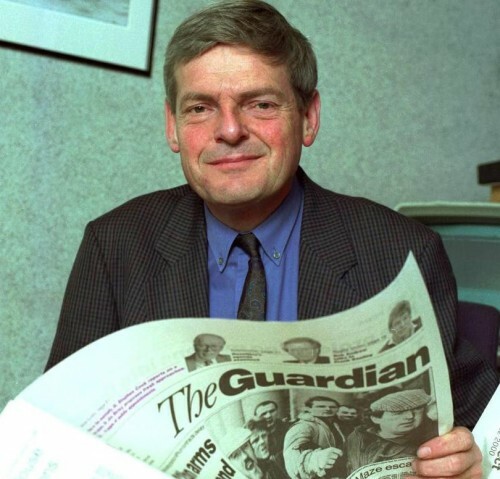 He was editor of The Guardian from 1975 to 1995, and what many people don’t know is that he was born in Barrow upon Soar and lived for most of his formative childhood years in Quorn. Many people in the village still remember Peter, often for his skilled conjuring tricks, which led him to later join the Leicester Magic Circle. He won a place at Loughborough Grammar School and went on to Oxford University. Peter’s mother, Kath and my mother were at school together, my parents were great friends of Kath and her first husband who had a wholesale fruit and veg business in Loughborough. Unfortunately Peter’s father contracted polio, which took his life aged 37, and infected Peter who had to go to Markfield Sanatorium where he spent time in an ‘iron lung’ to help him breathe. Peter recovered but with damaged arms and legs. During his time in hospital he read anything and everything. I am sure this led to his career in journalism and eventually his editorship of the ‘Guardian’. Kath remarried to Owen Brown, the managing director of Owen Brown Tents of Loughborough, although Peter and his siblings, Bill and Susan, still retained the Preston surname of their birth. The family moved to Quorn, purchasing ‘Bannockburn’ on the corner of Woodhouse Road and Loughborough Road, which was previously owned by a military man. As a child I played with the younger Browns when my parents visited, and enjoyed the solace and romantic elements of the garden, secluded yet so close to the main A6 road. I knew Peter briefly as he was off to Oxford University most of the time. Time moved on. Bill Preston became MD at Owen Brown Tents, Susan married and Kath died. Owen sold Bannockburn and moved to Woodhouse. Owen and Kath were my God Parents.